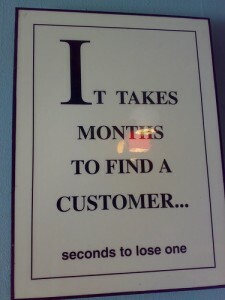 I was listening to an NPR talk show segment about customer service last week. It was mainly about being on hold, the friendliness (or unfriendliness) of the support givers, etc. There was a quote from a customer service person who said that they were rude because the customer service expense “sucked out whatever profit they made on the actual product”. And that’s what drew my attention. My thoughts were drawn to something we tried to emphasize at my last company: the better the quality of the product, the lower the customer service expense. I credit the high quality of our product to the practical-but-mandatory nature of our development process. And, there is a direct correlation between good-quality software and customer service expense. Duh. Yeah, I know. But this isn’t always obvious to people who should know better. “Agile-like” usually means no process at all, just keep it “flexible”, able to adapt to last minute brilliant flashes of marketing genius. No need to write down requirements – that’s so … 20th century. A lack of software project management practices results in poor-quality software. Poor-quality software causes high customer service expense (if there are customers). Paying attention to the bottom line – that should be important to someone, even one who doesn’t understand software development.